Is Jennifer Aniston pregnant yet again? That makes a big 17 times now! BLOG: After 16 'pregnancies', can't we just leave her alone? According to the world’s tabloids, she’s been pregnant with John Mayer’s, Gerard Butler’s and Justin Theroux’s respective babies, she’s endured at least 16 phantom pregnancies in the last five years and oh, yeah she’s also been pregnant with twins. If you hadn’t already guessed, we’re talking about Jennifer Aniston. The latest (and ongoing) target in the despicable celebrity bumpwatch game that takes a female celebrity’s body and makes it a target of weight gain speculation. Is she eating her feelings? Did she HAVE PASTA FOR LUNCH? Despite Jennifer Aniston’s representative, Stephen Huvane, denying the 44-year-old is expecting, it hasn’t stopped a barrage of online and tabloid articles suggesting the actress is pregnant to fiance Justin Theroux. You may be mistaken in thinking that there is an inkling of proof or even a “source close to the star” but no, there’s none of that. No, you no, evidence. It seems that afemale celebrity only has to touch her stomach, be unfortunate enough to catch a gust of wind in a floaty dress or have – gasp! – a rounded belly on the red carpet, for the pregnancy rumours to snowball. Overnight Aniston wore a tight satin dress to the New York premiere of her latest flick, We’re the Millers. The dress hugged her non-concave stomach and two weeks ago she had the gall to touch that same stomach – a gesture far more reliable to tabloid press than a Doppler or an obstetrician’s ultrasound. The media – tabloids in particular – have made watching women’s bodies a sport. And subsequently those women’s weight gains and losses have become the tabloid’s prime story lines. And in the middle of all this tummy-gazing and scrutiny we seem to have forgotten a very simple but very important fact. STOMACHS ARE NOT NATURALLY CONCAVE. The choices aren’t washboard abs, dangerously concave thinness or pregnancy. There are other options, like having a rounded belly is just a normal part of womanhood. Unless you have the fitness routine of a body builder, Tracy Anderson on speed dial and the dedication of a Gwyneth Paltrow on a cleanse combined then chances are your stomach will be rounded, and there’s absolutely nothing wrong with that. And, yes even the uber-toned and fit Aniston is prone to gravity and well, reality. What is the world coming to when a non-sucked in or spanxed belly must mean a baby is on the way? I’m glad the paparazzi aren’t parked outside my place, I’d have more (fake) kids than the Duggars. And of course a pregnancy at age 44 can’t be discussed without the inevitable fact that her baby window closing in, YOU GUYS, HER BABY WINDOW IS CLOSING. That’s why she’s been undergoing a series of in vitro fertilization (IVF) treatments, according to In Touch magazine, who have taken wombwatch to a whole new level by announcing the actress will be pregnant by her next birthday in February. The void left by the Royal Baby can’t even been blamed for so much discussion around Aniston’s reproductive organs, she’s been having fake babies in the eight years since her split from husband, Brad Pitt. 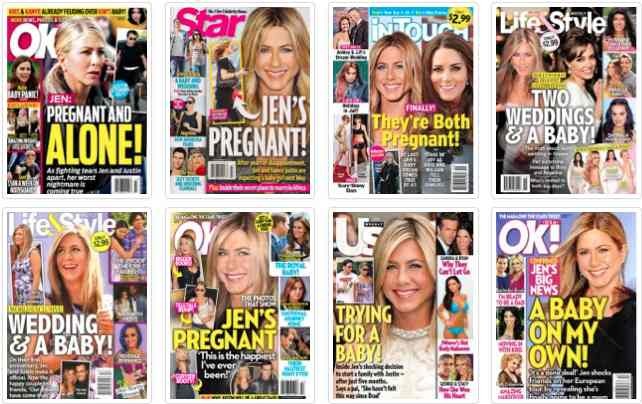 The press (and alright, the general public) would really love to wrap up the ‘Poor Jen’ narrative with a happy ending, which will sell plenty of mags is lovely and all that but the underlying message that a woman needs to procreate in order to be really happy/fulfilled is downright offensive. If Jennifer Aniston IS indeed pregnant, it’s actually none of our business. Lets all stop acting like an overzealous aunty at a family barbecue and being willing participants in this vile game.